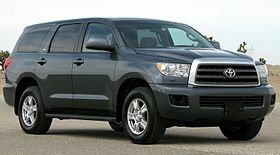 The Toyota Sequoia is a full size sport utility vehicle (SUV) produced by the Japanese manufacturer Toyota, at the Toyota Manufacturing Indiana factory in Princeton, Indiana, United States. It is derived from the Toyota Tundra pickup truck but differs in its use of an independent rear suspension. It is priced between the mid-size 4Runner and the full-size Land Cruiser. The Sequoia is the largest SUV currently sold under the Toyota marque. Both the Sequoia and Land Cruiser can accommodate up to eight passengers, however the Sequoia is slightly larger than the Land Cruiser, with partially larger leg room for the third row, and more cargo space behind the third row. Another difference is that the Sequoia is available in 2WD, and unlike the Land Cruiser, its 4WD system is not the permanent 4WD system. Lastly the Land Cruiser is more luxurious and upmarket, being the basis for the Lexus LX.